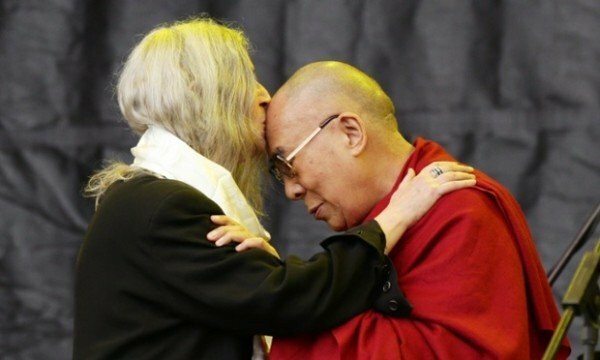 Fans gave an enthusiastic reception to the Dalai Lama after he joined punk poet Patti Smith during her Pyramid Stage performance at this year’s Glastonbury festival. The exiled Tibetan spiritual leader was introduced on the main stage by Patti Smith after earlier delivering a speech in the Peace Garden. Patti Smith presented the Dalai Lama with a cake in advance of his 80th birthday on July 6 and led a rendition of Happy Birthday. The Dalai Lama said he was an admirer of Patti Smith and her band. “I very much appreciate those singers and musicians – most of you with white hair,” he said. “That voice and physical action looks very beautiful.